Effective immediately, local renderers and stock removal companies will not pick up horses that have been euthanized with chemicals of any sort. This poses a significant problem for those horses needing emergency euthanasia due to suffering. Here is what we know and some solutions we can offer for disposal of equine bodies…Click here to download the letter. From critical care and sports medicine to routine wellness visits and reproductive care, our hospital is open to patients who prefer to be seen in a clean, climate-controlled environment. 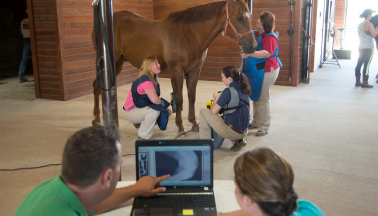 We utilize the latest in diagnostic imaging and monitoring equipment allowing our staff to provide unparalleled equine care. Our equine field service provides on-farm or at-home care of equine patients. Great Lakes Equine emphasizes proper health maintenance, preventive health care, as well as alternative medical healing options. We are capable of addressing almost any equine health issue that can occur on the farm. In the event of an emergency, Great Lakes Equine offers 24-hour emergency service. Horses may be seen on the farm or hauled into our facility. Patients are closely monitored by our veterinarians and expertly-trained staff. Our facility is well equipped to accommodate minor surgical procedures, medical colics, lacerations & eye injuries. We are a comprehensive provider of equine sports therapy services. No matter the injury, we use our wide variety of cutting edge therapies to return your equine to their pre-injury function. Great Lakes Equine will design a comprehensive plan and implement that plan to return your equine companion to full usability and happiness. Schedule your appointment in our climate-controlled hospital or set up your non-emergency surgery. Compassionate, expert care with the same high-quality equipment and staff available in our hospital. Great Lakes equine is on call all day, every day for any emergencies you may have. Call 920-779-4444. Need assistance with coming back after an injury? Let us get you back on the road to recovery. Thank you for all your help and expertise in diagnosing and treating Abner for cellulitis and laminitis. He is showing improvement daily! A special thanks to Dr. Rob for the phone consultation. Madison’s abscess stopped draining right after Dr. Sarah opened it up. He has his shoe back on and is walking well. Thanks again for all your help! Dr’s Rob and Adam, and staff of GLEWC: Thank you for your help and kindness with Tucker. Dr. Rob and Josh were amazing. They really cared about Jax and I, explaining thoroughly what they were doing and why. I am so pleased with their service. Jax’s eyes show that he feels better already! Your kind support and excellent clinical skills were a real blessing to us during a most difficult of times. Thank you for laying my friend down with quiet grace. Wonderful caring staff: from the doctors to the assistants. They made a tough situation easier for me just by being good honest caring people. The best vet clinic around. Would highly recommend!! We are so blessed to have wonderful, extremely knowledgeable and competent vets here in the Fox Valley. I love Dr Rob, Dr Kate, and Dr Adam! Such a great group! Dr. Rob is by far my savior! My horse isn’t in pain constantly and is rideable!